Students learn about the Qin and Han Dynasties. Then, they compare the two and give a preference, justifying their choice. Finally, they analyze the concept of the Dynastic Cycle. 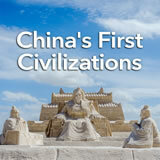 In this experience, students learn about the Qin and Han Dynasties. Then, they compare the two and give a preference, justifying their choice. Finally, they analyze the concept of the Dynastic Cycle. Describe the social, political, and economic development of the Qin and Han Dynasties. Identify key figures in early China. Describe important contributions from early China. China’s shortest dynasty and its longest one came one after the other. In this experience, you’ll learn how they affected China’s history and culture in very different, but equally important ways. There’s a reason movies are often based on history. It’s because history is often wild and unpredictable. But there is a real difference. In a movie, you can usually tell who the heroes and villains are. In history, the same person is often both. There was an ancient Chinese leader who was very, very cruel, but he is sometimes considered the father of his country. Go to Qin Dynasty and scroll down to watch the “China’s Warrior King” video. Suppose you were an advisor to Emperor Shi Huangdi. What would you tell him in order to help him improve his reign? At the Qin Dynasty, students only need to watch the video. However, you and your advanced students may wish to read the text for additional historical background. The sections “Definition,” “Achievements in the Qin Dynasty,” and “Legacy of the Qin Dynasty” are richest in concepts and are least cluttered with names and dates. The Complete List of Learning Experiences in Ancient China Unit.